Sometimes I feel trapped on an island…. At school, Pearl feels as though she is in a group of one. 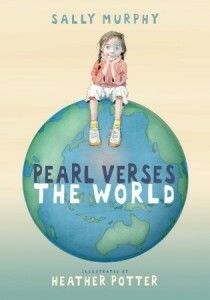 Her teacher wants her to write poems that rhyme, but Pearl’s poems don’t. 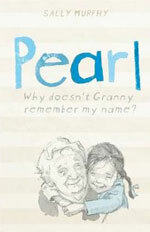 At home, however, Pearl feels safe and loved, but her grandmother is slowly fading, and so are Mum and Pearl. When her grandmother eventually passes away, Pearl wants life to go back to the way it was and refuses to talk at the funeral. But she finds the courage to deliver a poem for her grandmother that defies her teacher’s idea of poetry – her poem doesn’t rhyme; it comes from the heart. Available in good bookstores or buy online:Australian edition or US edition. Teacher’s notes for Pearl Verses the World are available on the Walker Books website, and my ideas for using the book in a year five classroom are available here. Winner of the Children’s Book category in the Indie Awards, 2009. Shortlisted in the Queensland Premier’s Literary Awards, 2009. Don’t be fooled by the different cover and title – this is actually the same book as Pearl Verses the World. If you are in the UK, this is the version you will find in bookstores, or online here. This novel is so well written, beautiful descriptions both comical and thoughtful are in plentiful supply and this is the over riding feature of this novel – the talent of the author shines through on each page.